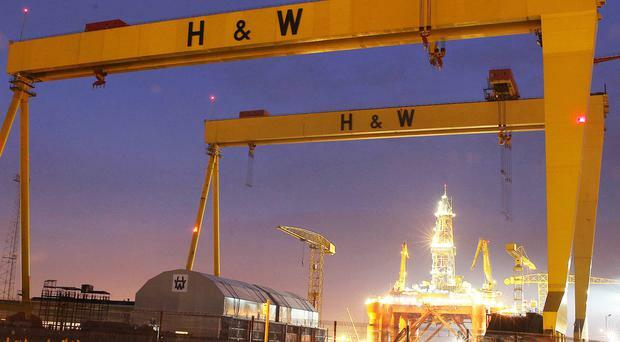 Harland and Wolff has broken a world record at the Belfast shipyard - by performing the world’s heaviest single point WaterLoad test. The massive Samson gantry crane lifted an incredible 774 tonne load to certify Harland and Wolff’s latest spreader beam arrangement. The spreader beam has been a strategic investment to support the company’s handling capability for large offshore structures such as jackets and offshore modules. They provided 24 bags of various capacities which, when filled with water, provided the total load of 766 tonne - which is the world’s heaviest single point WaterLoad test. Unique Seaflex’s site services manager Ben Board said: "We are delighted to have been selected by Harland and Wolff to execute this historic test. We have been coordinating with the client for a number of weeks to ensure a safe, expedient and well-engineered solution. "We provided all the water bags from our own extensive stock and with the insight gained from this project are looking forward to repeat business with other clients." The actual test was over in a matter of minutes, however each water bag took 20 minutes to fill. The test equipment had a wireless link from the lifting gear shackles to a remote load monitoring station to observe the incremental loading. The test was witnessed and certified by the Lloyds Ireland Surveyor Graham Knowles who was satisfied with the operation and pleased to participate in this unique world record. Harland and Wolff construction manager Chris Matthews directed the entire operation and was delighted with the result. He said: "This is an important milestone in Harland and Wolff’s heavy lifting capability for offshore fabrication projects. The spreader beam combination is purpose designed for the lifting of jackets onto barges, but can be used in a variety of configurations for a range of heavy structures."